I am a graphic designer who does MANY logos. Right now, I am very busy with a very large project and need your help to either begin or continue the work that I have already started on some logos. I am posting many contests so I can get assistance completing these jobs ASAP. The freelancers who provide the best designs will not only win the contest, but I have many more jobs in the future, and I am always looking for good talent. The prize money for my contests will range based on the talent I am trying to attract to the job. The range will be from the minimum contest price to $300+. This is also based on my clients' budget and how much work has already been done on the project by me. Some of these jobs will be awarded within a few days of the contest start - so please don't wait to submit your concepts. CLIENT BRIEF: I am a certified public accountant and need a logo. 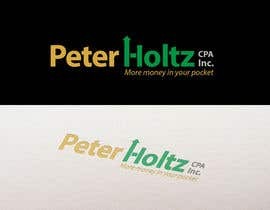 Business name is Peter Holtz CPA, Inc.
i like the colors like a kelley green and gold. Something in that colors would be preferable but I am also open if you have a better idea. Company Name: Peter Holtz CPA Inc.
What are some logos that you absolutely love. What aspects do you enjoy the most? (direct links are perfect) I am thinking word based like Staples, where a symbol becomes part of the word. MY COMMENTS: Please be creative and Good Luck. I will probably award this within the 1st 3 days, uness I need more time for good concepts. Check #149 #150 #151 #152! THX.! Please contestants, no copies from other sites allowed. Better just a simple idea, but to be your own work, even if it is very hard to design it. I hope nobody wants to get reported and banned, so please design it on your own. Recently another contest had closed and after few weeks I found the design belonged to a very prominent company. No getting back now, so please have a good conscience and before you post anything, better first think about the clients who give their money for a real logo. All the best and all the good luck to any fair and honest designer! Please review number 21, thanks! !